We were pleasantly surprised to move away from our normal KOA facility and stay here instead. Friendly and helpful staff, clean bathrooms with hot showers and nice level pull thru sites. The camp store was situated a bit differently, being in a large, open hall, (which also housed the game room), but it was sufficient. The pool was really nice with an abundance of lounge chairs for adults and a zero entry area for kids. Plenty of activities, including a Sunday service, during the busy Labor Day weekend. Close to Lake Erie, I 90 and I 75, but far away that it was quiet at night. Speaking of quiet, there were no dogs barking, kids screaming or rowdy adults after 11:00...PEREFCT! We have every intention of returning. The site driveway and stone roads had gravel that was much too large. My wife twisted her ankle. Joey's Circle sites (ours #74) were no better than an overflow field - open field, rough grass, no shade and, of course, a big price of $58(tax included,WES) even with the 10% GS discount. I definitely feel that Good Sam needs to visit and rerate this campground. As travelers, we rely on your ratings heavily when we are choosing a camp. The seasonal sites were better but I hope that's not what Good Sam totally bases their ratings on. If so, as short time visitors, can we trust your ratings at all? We understand that we may be put in a field, however, to be charged that high a price for such a site is unconscionable. Park is nice, but sites are tight. Main issue was the noise from other campers well into the night. Other campers were outside partying loudly until after midnight. The park does not enforce quiet times so you can sleep. FYI: Our rig is 42' class A motor home Staff was very nice and the campground is maintained well. Each campsite had a fire ring and picnic table (the plastic kind.) The first site we were assigned was so unlevel we could not get our motor home leveled even with putting extra blocks under the rear wheels. The site was slanted backwards. The staff assigned us to another site with no hassles. This site was very level. 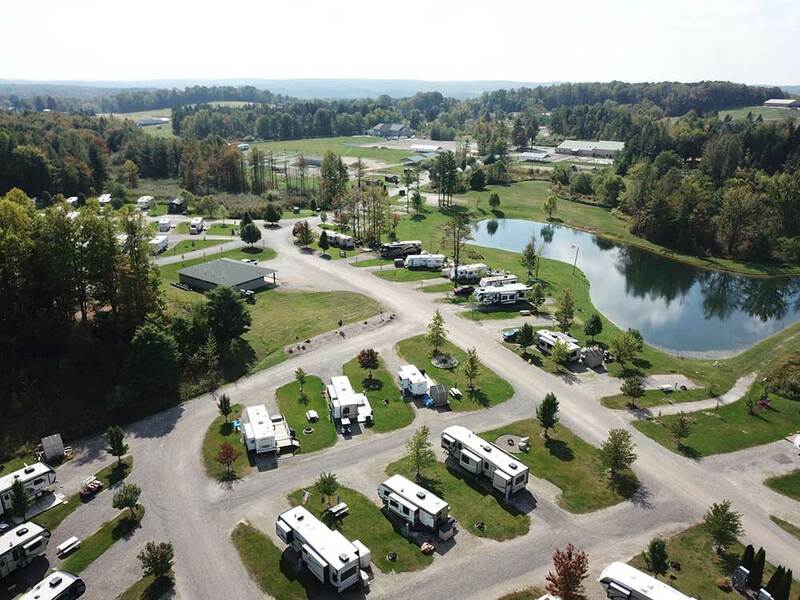 Campground is very close to Erie and only a 2-hour drive to Niagara Falls. We didn't use the camp restrooms, so I didn't rate those.